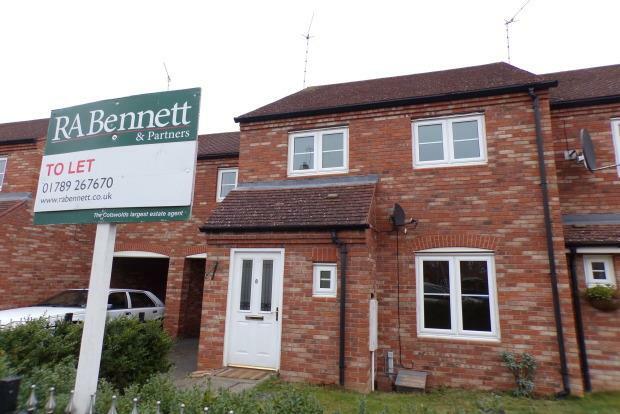 4 Bedroom House To Rent in Stratford-upon-Avon for £1,125 per Calendar Month. This home is set in a quiet cul-de-sac within the popular Trinity Mead development, walking distance of Stratford's town centre. Currently undergoing redecoration throughout this property is ideal for a family with a pet looking for an affordable 4 bedroom home. There is a small garden and driveway parking for 3 cars to the front of the property. The front entrance leads into a reception hall off which is the living room which in turn leads through to a dining room with an understairs storage cupboard. The dining room has double doors overlooking and leading out to the garden mostly lawn with some mature trees at the end of the garden offering some privacy. The kitchen includes a recently upgraded gas boiler, oven and hob and provides space and plumbing for a tenant to bring their own washing machine, dishwasher and fridge/freezer. There is also a door from the kitchen out onto the rear garden. Upstairs there are 3 double bedrooms and 1 single bedroom. There is an en-suite shower room to the master along with a main family bathroom. Once redecorated throughout this home will have the carpets professionally cleaned. Offered unfurnished and available NOW!